Fold three or more fat quarters of fabric into triangles and then stack them, arranging the points in a staggered fashion. Three fabrics will resemble a star, and taller stacks make impressive displays. When you're finished, tie the bundle together with pretty yarn, silk ribbon or another embellishment -- something that your quilting friend might use to decorate a fabric postcard or crazy quilt. Follow the instructions on pages 2 and 3 to make these pretty fat quarter stars. Quilters love fat quarters, one-fourth yard cuts of fabric that measure about 18" x 22". They are created by dividing a yard of fabric into four large rectangles instead of cutting it into typical 9" x 44" quarter-yard cuts across the fabric's crosswise grain. A narrow standard cut of fabric is good for ​strip piecing, but a fat quarter makes it possible to cut out patchwork pieces that are larger than a standard 9" wide cut would allow. Fat quarters are always excellent gift choices for quilters who are on your shopping list. You might have heard your friend mention some of our quilting lingoes, like the words batik, 1920's fabrics, Civil War prints, and florals. Terms like that are good clues to preferences, so use them as a starting point when you search for fabrics. If you're not sure about fabric types, find pieces in their favorite colors or surprise them with something beyond their comfort zone by including prints and colors they might not choose for themselves. Once you have the fat quarters it's easy to fold them into decorative triangles that can be stacked together to create pretty, star-like bundles. Fold a fat quarter along its longest edge with wrong sides of the fabric together. Fold again, but keep the matched raw edges of the fat quarter just slightly inward from the first folded edge. Turn down the left corner of the column, making a point in the column's upper right corner. Fold it down approximately midway across the column as shown in the photograph above, don't bring the raw edge over to meet the opposite side of the column. Bring the first folded edge downward as shown above, left, aligning it with the left side of the fabric column. Tuck it in a bit to make sure the top edges remain pointed at their corners. Keep folding the fabric onto itself down the length of the column, matching each new folded edge with alternating edges of the fabric column and tucking as necessary to keep points sharp. When you reach the end of the column there won't be quite enough fabric to make a new fold--above right. Tuck the remaining fabric into the opening along the edge of the triangle. Experiment a bit and you'll find a routine that works well for you. I like to press at least the first fold in the column because it helps me make crisp points. It's more difficult to describe the folding procedure than to do it, so grab a few fat quarters and give the method a try. 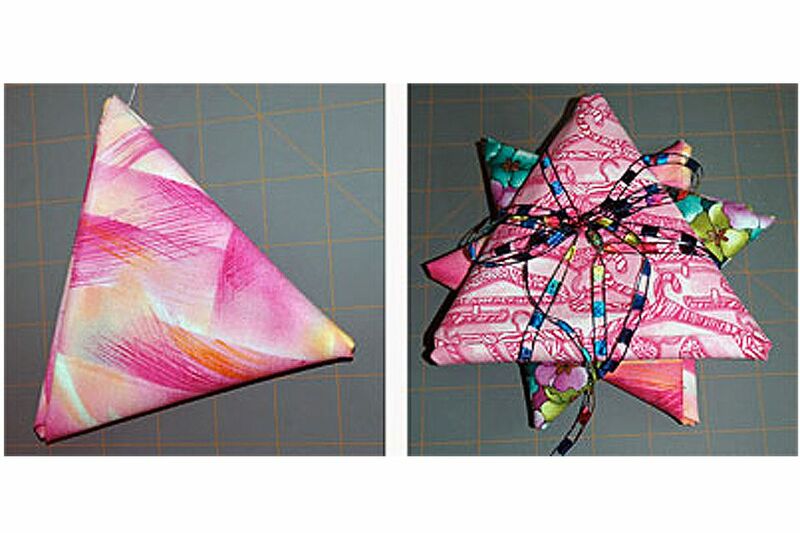 Stack the folded fabrics to create a star as shown on page 1. You might also like to decorate a gift with a folded star ornament that's customizable for any season or event.